Slightly crispy edges, soft fudgy centres – all prepped and baked with only a few tools in under 30 minutes with very little work done at all. 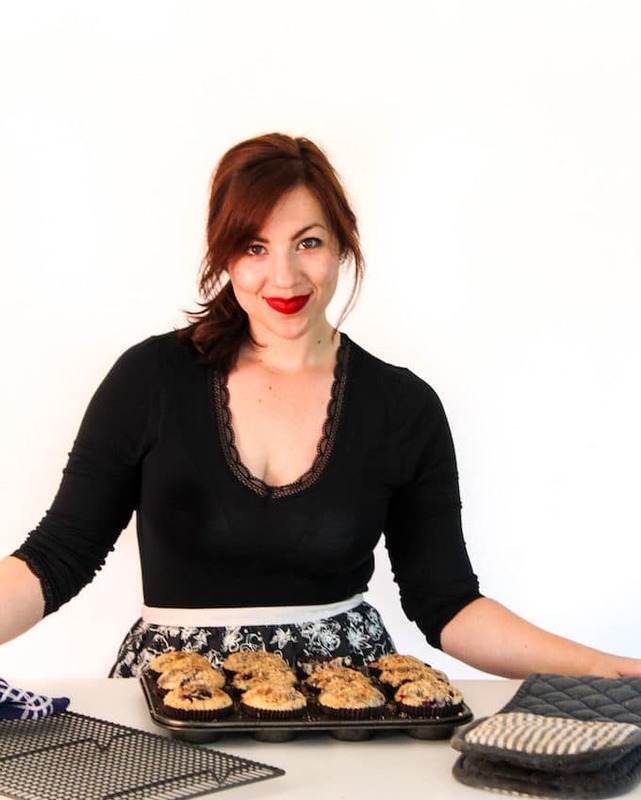 Altogether these cookies are super easy to make with pretty basic ingredients. 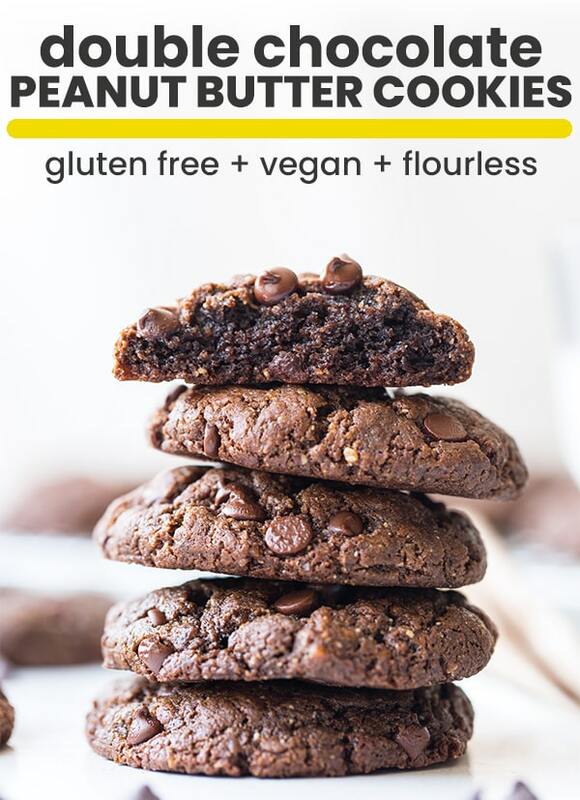 They’re based off of my three ingredient gluten free vegan peanut butter cookies – these ones include a few extra ingredients for a more fleshed out cookie. Making these is mostly just a matter of mixing together the wet ingredients and then adding in the dry. You don’t need any special equipment – just a mixing bowl and spoon will do. 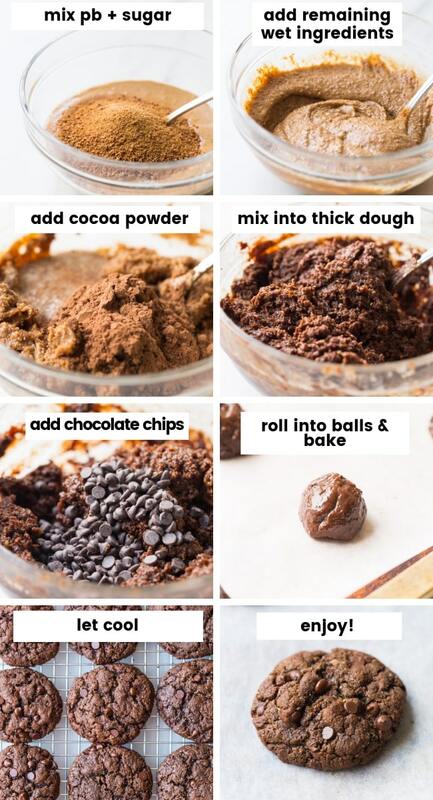 Once mixed, just roll into a ball, place on your baking sheet and that’s it. Can I make these with regular eggs? Yes! Just use two eggs in place of the flax eggs. The moisture from the eggs provide enough moisture that you can also leave out the almond milk. Any sort of granulated low carb sweetener like erythritol can be use in place of the sugar here for a keto friendly alternative. 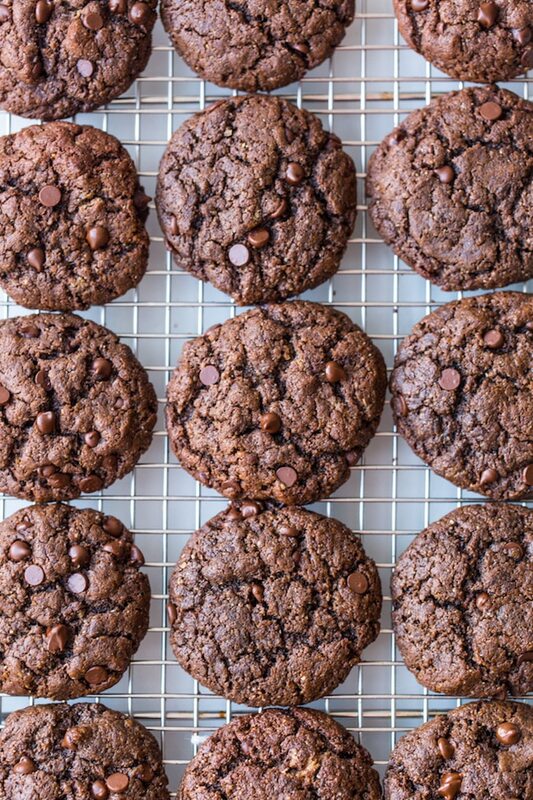 You’ll also want to either use low carb chocolate chips or just leave them out altogether. Freeze the Dough: First place the dough rolled into individual balls on a baking sheet or place (one that will fit in the freezer) and freeze for an hour or two until firm. Once firm, transfer the balls to a freezer safe bag – remember to label your bag with the name, cook temperature and cook time. To cook from frozen you will need to add an extra 1-2 minuets to the overall bake time. Freeze the Baked Cookies: Allow the cookies to cool completely. Freeze the cookies on the baking sheet or a large plate (one that will fit in the freezer) lined with wax or parchment paper for a couple of hours to firm up. Once frozen transfer to a freezer safe ziplock bag and that’s it. Cookies will keep well up to three months in the freezer. When you’re ready to enjoy let thaw outside of the bag/container at room temperature for at least 10 minutes and enjoy! 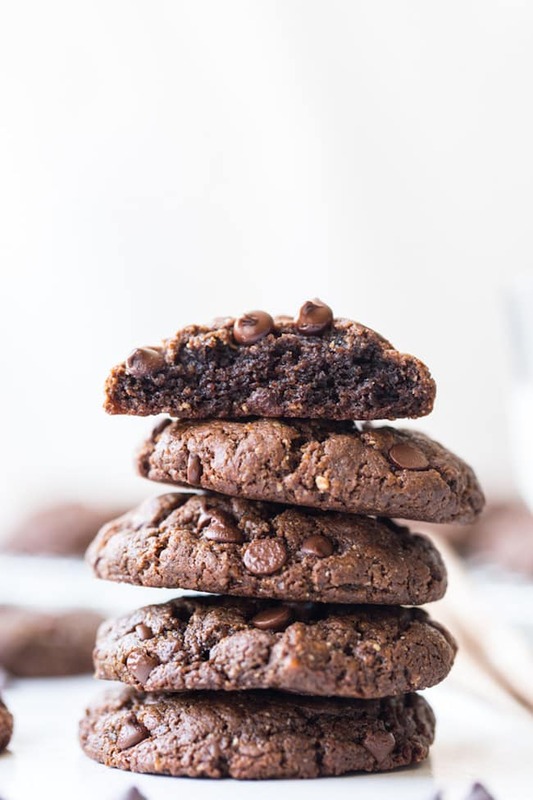 Don’t forget to #asaucykitchen on instagram if you try these Flourless Chocolate Peanut Butter Cookies! We love seeing what you make! You can also post your pictures to my facebook page! Preheat oven to 350°F/175°C. Lightly grease or line a couple large baking trays. Set aside. Mix together the peanut butter and sugar together in a medium sized mixing bowl. Stir in the flax eggs, milk and vanilla extract. Add the cocoa powder and baking soda. Stir until combined and no lumps remain. A thick, slightly sticky dough should form. Stir in the chocolate chips. Scoop out the dough - about 1 1/2 tablespoon worth of dough and roll into balls. Place on the prepared baking sheets, about 2 inches apart as they will spread slightly. Place in the middle of the oven and bake 10 minutes. When done, remove from the oven and allow the cookies to cool on the tray completely before moving. Make the flax egg: Mix 1 tablespoons ground flax (or ground chia seeds) with 2 tablespoons water. Stir and set aside about 10 minutes until the mixture gels up and then you're ready to use it. Once ready, use it as you would a regular egg. Make sure to let to cookies cool completely before trying to handle or they will crumble. Let them cool on the cookie sheet. To make it low carb you can use a keto friendly granulated sugar sub like erythritol or xylitol. You can use 2 regular eggs in place of the flax eggs. If using actual eggs leave out the almond milk. I just made these!! I accidentally added 2 real eggs AND the milk but they still turned out soooo good! A little messy, but amazing taste!